Charles Peter Nicek was born in the former Czechoslovakia (now Czech Republic) in 1926. His parents, Carl and Marie, had lived for several years in Chicago, where their two oldest children, Paul and Marie, were born. They returned to their homeland soon after the birth of Marie, and Charles and younger brother, Alvin were born there. As tensions mounted after Adolf Hitler took power in Germany, the Nicek family fled their homeland for good in 1934, this time heading for Oklahoma City. Carl was a bookbinder and easily found employment, while the children attended Putnam City schools. During World War II, Charles served in the U.S. Army and returned to Oklahoma City afterward and headed to OU to study architecture. He arrived at the university around the same time that Bruce Goff began teaching there and graduated around 1951. After graduation, both he and his older brother, Paul, worked as draftsmen for Hudgins Thompson Ball. 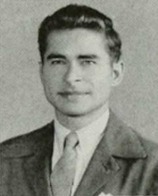 In 1953, he and his wife, Yvonne moved to Wichita, Kansas, where he worked as an engineer for Boeing, but he was back in Oklahoma City and practicing by 1955. Charles continued practicing until he was diagnosed with ALS. He died in 1980. He was 54.